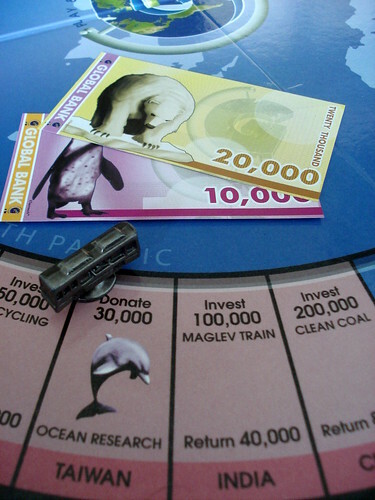 Our copy of Global – The Game was kindly supplied by the publisher Teamwork Toys. Thank you. The Internet has become a part of pretty much everything we do: shopping, socialising, reading news, reading about boardgames, even playing boardgames is easily done through the net. It was only a matter of time before someone would come up with a game that is played around a table but uses the Internet as an integral part of the game. That time has now officially come and Global is trying to fill that particular niche. Global is a weird animal that eats a bit from all pots: it’s a boardgame that requires the Internet to play and it’s an economic game that wants to educate players about global environmental and other problems. But in the how-to-play section, it doesn’t reinvent the wheel and goes for the tried and tested instead. Lets see if you recognise the gameplay: when it’s your move you roll two dice, move your peculiarly shaped meeple – we have a car, a motorcycle, a train a bus and a boat to offer, all environmentally acceptable as the rules assure us – and land, in most cases, on a country. There you can invest in a local research project by handing over a big chunk of cash to buy one, two or in some cases three certificates for that country. Except when someone else invested there first, in that case you have to pay all prior investors before you may buy remaining certificates. Does this sound familiar at all? Yeah, to me too. Even the countries on the board look like streets on Monopoly, the big difference is that up to three people can own certificates of any given project, so it’s a kind of Tripoly. Two more differences cut down on the often criticised playing time of Monopoly. The victory condition in Global is to own $1.000.000 worth of certificates and you start the game with $740.000 in cash; you don’t need a huge income to get to the required amount and the cited time of 60-90 minutes usually is enough to finish the game. The other, less welcome, change that shortens the game is that it’s impossible to fall into debt: if you have to pay more money than you have left, you’re eliminated. 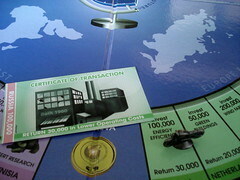 So far, so Monopoly. Now where does this new-fangled Internet stuff come in? The first time before you even start playing: no rulebook is included in Global, you have to watch the explanation video on http://www.globalthegame.com. Now, I basically live on the Internet, I earn a living doing Internet things and spend a lot of my spare time using the Internet, but when it comes to reading game rules, I prefer to have them on a piece of paper for easy reference. Beyond that, the use of the Internet becomes much less annoying, although it doesn’t introduce anything fundamentally new. Where you would draw a card in any other game, in Global you draw a netcard that has the same function but can easily be updated with new cards without shipping them to you in a envelop every time. Newsflash cards are your standard event cards: something happens that either makes you money or costs everyone money. Conference card have a deeper purpose: when you’re invited to a conference, the webcard shows a plan for a new project that all players take a hidden vote on and everyone voting on the majority side wins money. This is the core of Global: there is no right or wrong answer to the conferences’ plans, they should be understood as a discussion starter around the gaming table. Their success, of course, varies. Whether the UN should implement a global water distribution project did start a discussion about use and feasibility of the project. Whether plastic bags in supermarkets should be banned had people less involved, especially with the “Con” on the webcard that “people would have to bring their own bags”. Sometimes it’s better to leave the pros and/or cons empty. The concept of webcards could indeed be successful – if people play the game often enough – if the publisher sticks to the plan and updates the cards regularly with new content. Without these updates, this is the invention of a more annoying card draw pile. I’m disappointed by how little use the webcards make of the capabilities of the web: you may receive new cards occasionally, but you’re still basically drawing cards. The chance to use what people with a strong buzzword-addiction call “Web 2.0” – the social, communicative side of the Web – was completely missed and could have meant a big upgrade to the webcards: one click to tell the world what your group voted for could lead to interesting statistics to display on the page and maybe even gather useful information from. A link from each conference to some sort of forum to discuss the up- and downsides of this plan might have lead to interesting discussions – and of course vast amounts of trolling and profanity, I’m enthusiastic about the Internet but not delusional. Something like this could potentially enhance the educational aspect of Global. I can virtually hear the thoughts of all the readers here thinking: “Finally a good use for that iPad!”. It’s true, but remember that you need do download the app (which is simply called “Global”) because the flash-based website is not going to do a thing for you. The design of the boardgame part is another thing I’m in two minds about: I like the packaging concept of putting everything in a bag made of coarse, probably recycled, plastic and packaging the certificates, money bills etc. in sheaths of the same material. I also like the graphic design with individual illustrations for the certificates and animal pictures on the money. I am, however, not happy about the choice of material for money bills and certificates: the shiny paper has a strong tendency to stick together and is a pain to count out. Everything is also only printed one-sided, maybe to offset the increased cost of having everything sparkle. Given the environmentalist message of the game, printing on recycled paper might have been better for everyone: the environment and the players who have to count it, and the money saved on the material could pay for a printed backside. What is Global in the end? A Monopoly stripped of one of it’s most annoying features – playing time – but also stripped of strategic depth: there is no sets of countries to collect here that you would try to trade for, no investment to increase the value of a property. 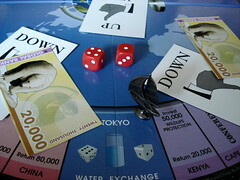 Instead, there is a stronger emphasis on lucky roles because the way to make money is for people to land on countries you invested in, and unlike Monopoly you cannot forge a strip of properties that is hard to pass without paying, you have to rely on your opponents rolling the right number. The webcards are a nice thought but aren’t living up to their potential. I can see it playing well in youth groups to stimulate discussions, but playing with “professional” boardgamers there’ll usually be a better choice around.